I like trying out new food products that are healthy. Especially when they are fast, easy, and healthy. Like bars. As you know I like to eat bars a lot. 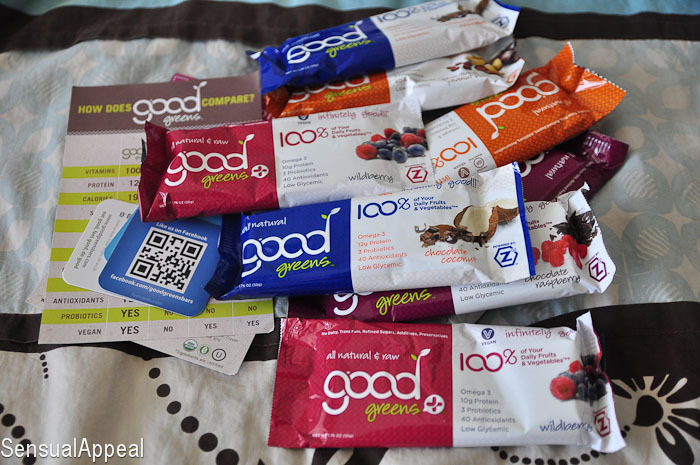 I don’t eat bars every day, but when I do, I opt for the healthiest ones I can get my hands on. Or try to anyway. So Good Greens popped up on my Twitter suggestions one day and I decided to give them a go. They are very confident in their product and eager to compare it to other category leaders. Very appealing. Truthfully, the nutritional stats are amazing. The bars are also big and yummy! Besides having such great facts about their nutrition, the company does more than just provide products that taste good. Their whole ordeal has to do with the word “good” and they have three sections of the website: eat good, feel good, and do good. They want to make sure they provide products that taste good (if not great), that make you feel good about eating them, and encourage us to do good by attending various community events they support and sponsor. The whole thing makes me feel happy that the company cares so much about customer happiness and satisfaction beyond just the simple flavor quality. Back to the bars: I received four of the flavors –chocolate raspberry, chocolate peanut butter, chocolate coconut, and wildberry. I love the chocolate varieties they offer, I am a total chocoholic (but only when it’s healthy 😉 so I was thrilled to see these options. Additionally, their products are vegan, gluten free, full of antioxidants, and contain 100% of our daily fruits and vegetables! Which is perfect if you’re looking for a bar to feed your child that doesn’t like fruits & veggies, give ’em a “candy” bar and they got their needs met. Awesomeness. My favorite of the bunch was chocolate coconut, followed by chocolate raspberry. It was freaking amazing, and probably the best bar I have tasted in a long time. I think it was even better than my favorite Balance Bar S’mores that I used to obsessess over. The nutritional stats are obviously also much better and I can’t pass up on the 1oo% daily needs fact. Good Greens has won me and my heart over. Consider me sold. My poor, poor wallet. Oh, I also really like the little social media cards. I want some like this. Haha, this is my inner social media geek talking. Don’t judge. Ok, so you’ve seen my blog…I am slowly becoming a total bar whore! Why have I NEVER heard of these before? The nutritional stats are awesome and like you said, they look to be a pretty good size…I’m about quality AND quantity when it comes to bars…those super tiny 200 calorie bars always leave me wanting more! Do they sell them in stores, or do I need to look online? 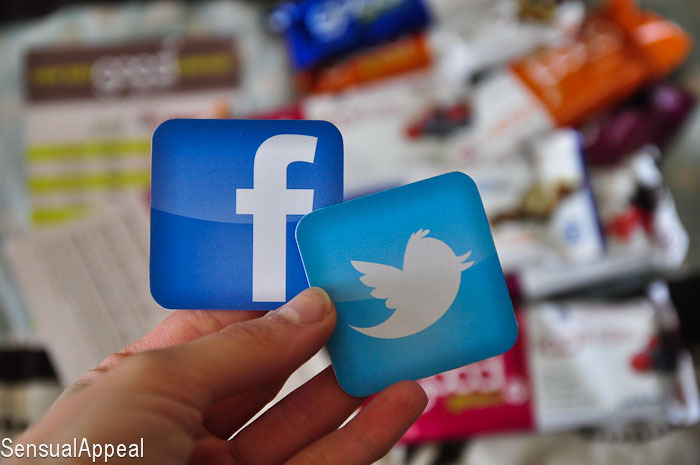 And those little facebook and twitter cards are totally adorable! Want! 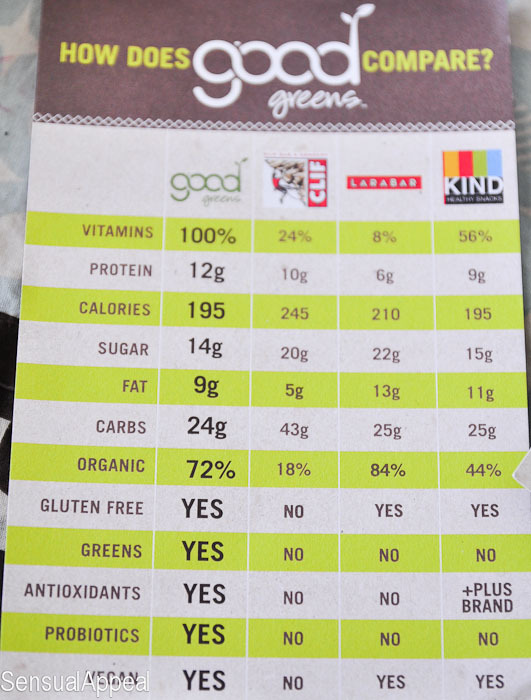 Check out their locations here: http://www.goodgreens.com/eat/locator/ it’s none of the stores I know that are near me so I have to buy them online. But they are oh so worth it. It upsets me when I eat a 200 calorie bar that’s small, and of course I end up wanting more. Quantity is definitely just as important as quality.